The Ides of March, as many of you know, is upon us today. According to various unreliable internet sources that I overuse, the Ides is the middle of the month and supposedly when the full moon is supposed to occur. It is the 15th day of March, according to the Roman calendar, and also the day that Julius Caesar was assassinated by his "buddies" at the Senate. 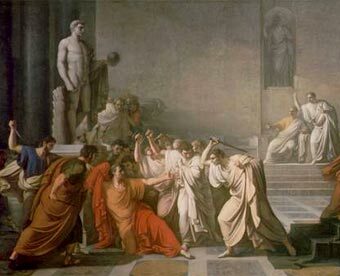 It was such a significant event at the time (despite nearly every emperor being murdered by an enemy or heir), that "the Ides of March" became synonymous with the assassination, as it is now. Cicero is quoted as saying "The Ides of March are encouraging", instead of saying it gladdens his heart or gives him hope since their beloved tyrant was murdered. He knew that people would get his drift. According to Plutarch (a major ancient historian), a seer told Julius Caesar that he would not live past March 15th, and like any good leader, he paid little mind to the person shouting at him on the street. William Shakespeare made that encounter popular in his work Julius Caesar. In case you did not know this, that literary masterpiece is offered for free over at Project Gutenberg. If you've never had the opportunity to read it, this is your chance to get your hands on it for free. Celebrate the Ides of March & Download Julius Caesar Here! Oh, and if you have any friends named Brutus, you should probably not hang out at the capital with him today. Just sayin'.